Climatic patterns are extremely strong impulse moves in one direction without any counter price action movements such as corrections or retracements. 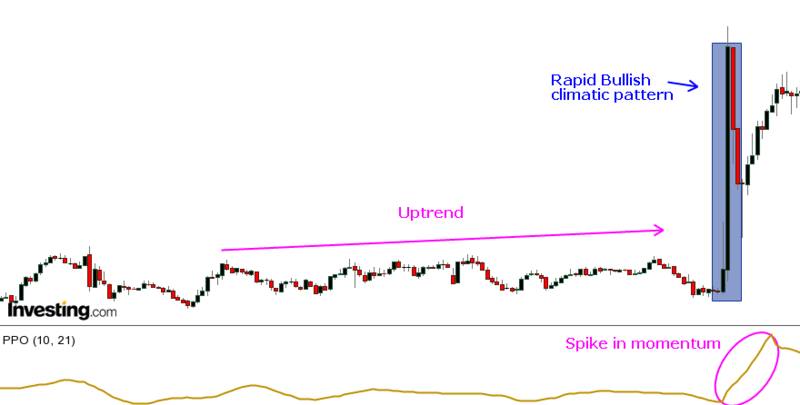 On these types of formations a type of short-term mania sets in as emotional buyers or sellers chase the market in the same direction. At some point, market becomes extremely vulnerable to move in the opposite direction. Even a slight dip or raise would lead into sharp movements, due to feedback mechanisms. This type of structure is often called a parabolic move or a blow-off. Also that the range of the bars in the blow-off becomes larger than previous bars as the trend steepens and the bars pull away from the average; this is a reflection of expanded volatility, specifically intraday volatility. There will also often be a very large volume spike near the extreme of the climax move. It is not uncommon to see bars that trade four or five times the average volume for the instrument, but this information is also mirrored in lower time frame price action and volatility. Another common characteristic is that many more bars close at or near their high in a buying climax and on their low in a selling climax. This shows that the climactic conditions extend to the intraday time frame as well, which are probably showing exhaustion or climaxes on their own time frames. Climactic patterns can be defined only by their proportional relationship to recent market history. Volatility contracts greatly in ranges, so any indicators measuring range expansion will also be skewed—in other words, it takes a much smaller movement to make a climax pattern on a breakout of a range. Furthermore, strong breakouts of ranges, even if they are apparently climactic, usually see continuation, and it is probably best to look for climaxes only after extended trends. Markets move in response to emotion; robust technical analysis quantify those movements and underlying emotions in ways that make them consistently readable, even in extreme examples. 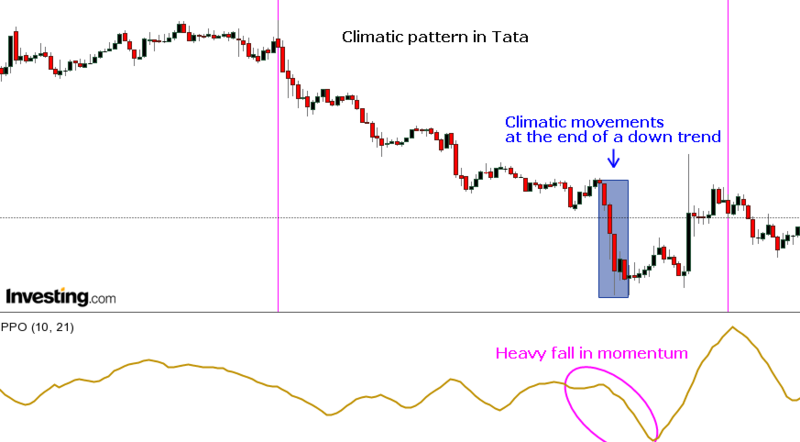 Climax patterns are important and can be extremely dangerous to traders who do not understand how they work. Most important key point is that, you can identify the characteristic patterns of climaxes on charts to avoid getting caught in the mania or the panic of the crowd. Some of the most important characteristics of climatic patterns are that they usually come after two or more trend legs in the same direction. Show acceleration in the direction of the previous trend. Many analysts and traders describe this as a market that has gone parabolic. Small exhaustions into previous support and resistance is common, especially on lower time frames, and may not define important structural points for the market on higher time frames. It is not possible to identify these areas with 100 percent accuracy, and it is not always possible to separate climactic moves from simple strength or weakness that should see continuation.